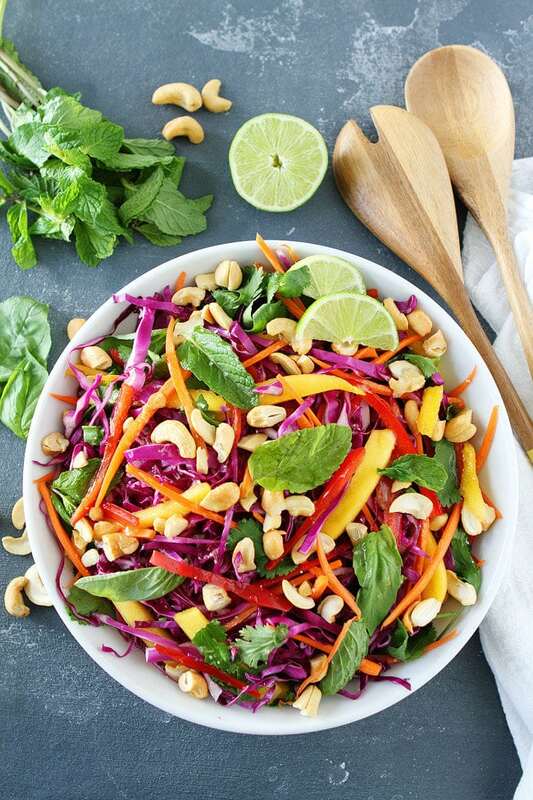 This healthy Thai-Style Cabbage Salad is light, bright, and packed with crunch and flavor. 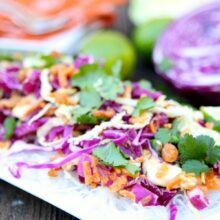 I spotted the recipe for this Thai Cabbage Salad in Laura’s new cookbook, The First Mess Cookbook, and immediately bookmarked the page. It looked so fresh and delicious and right up my alley. I made the salad for lunch and it really hit the salad spot. It was light, crunchy, and full of flavor. And look at those vibrant colors. This salad is a showstopper. 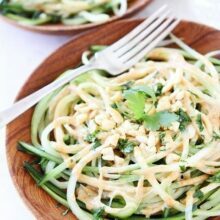 The simple lime ginger dressing was easy to whisk up and so refreshing. I especially loved the addition of sweet mango and the trio of herbs, cilantro, basil, and mint. Sooooo tasty! And the cashews at the end gave the salad a nice salty crunch! 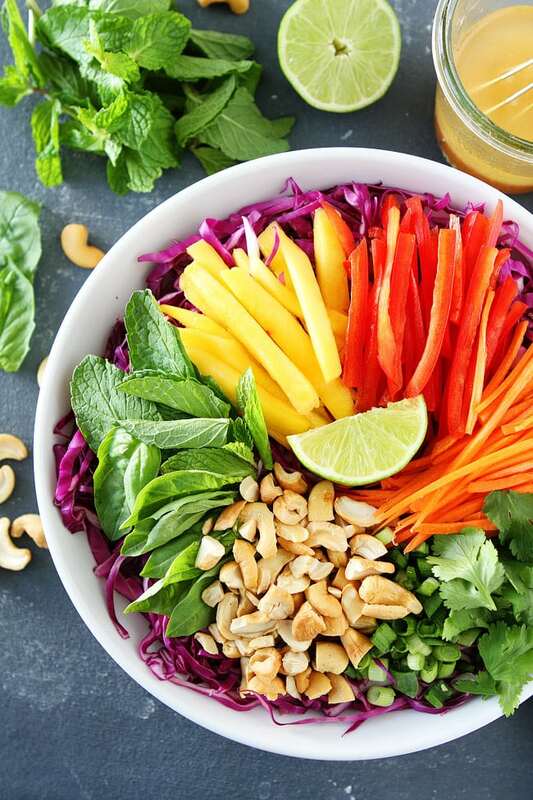 This Thai Cabbage Salad has it all! Add it to your salad rotation. It is perfect for lunch, dinner, potlucks, and parties! And make sure you check out The First Mess Cookbook. 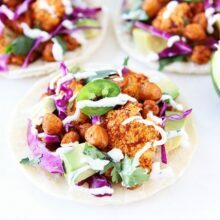 It is filled with over 125-plant based recipes that are approachable, wholesome, and delicious. And the photography is STUNNING! 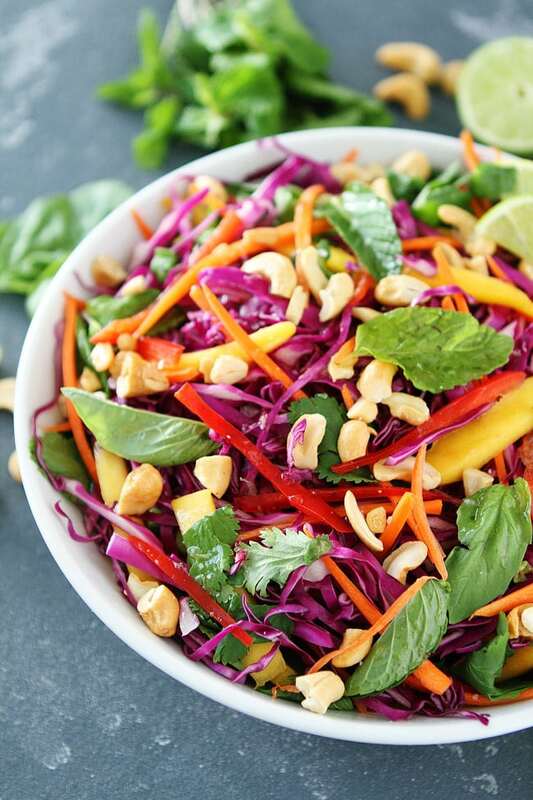 This healthy Thai-Style Cabbage Salad is light, bright, and packed with crunch and flavor. It is great for lunch, dinner, potlucks, and parties! First, make the dressing. In a small jar with a tight-fitting lid, combine the lime juice, garlic, ginger, maple syrup, Sriracha, salt, pepper, and grapeseed oil. Tightly secure the lid, and shake the jar until the dressing has a creamy and smooth consistency. Taste and adjust seasoning, if necessary. Set aside. Place the shredded cabbage in a large bowl. Using a vegetable peeler, make long strips from the carrot or cut into really thin strips. Remove the seeds and stem from the bell pepper, cut it into strips. Carefully cut around the large pit of the mango. After you have all of the usable mango you can get, cut the fruit into thin strips. Add the carrot, red pepper, and mango strips to the bowl with the cabbage. Add the sliced green onions, mint, cilantro, and basil to the salad. Season with salt and pepper and toss to mix. Pour the dressing over the salad and toss to evenly coat. 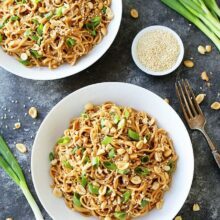 Garnish the salad with chopped cashews or peanuts. Serve immediately. 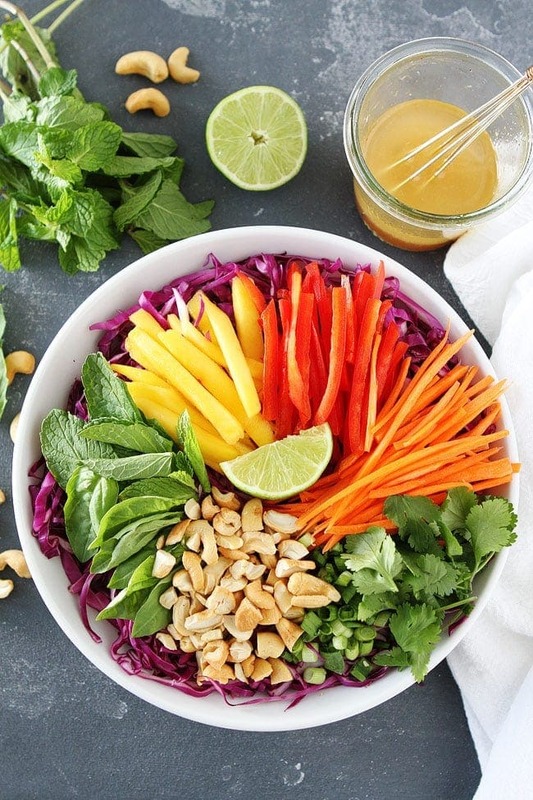 What a beautifully vibrant and colourful salad! I love Mommy Food 🙂 (that is so cute!) 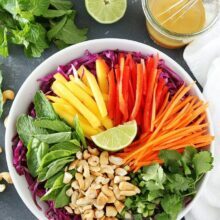 this salad looks gorgeous and all of the colors are calling to me! Looks very tasty! Has a Healthy Appeal to it. This looks incredible! I need to add this to the menu plan next week! It is a good one! Enjoy! I don’t think I’ve seen such a colourful dish! This is a must make recipe for me. Thanks guys! Anything this beautiful MUST taste just as good!